Residents at Lochhead Court in Stewarton held a party to mark a major anniversary in the history of the site. The residents got together to enjoy a special buffet lunch to celebrate 20 years since the development opened. Musical entertainment was provided by local singer Jim Stirrat and residents were also given the chance to get up and perform a few songs. 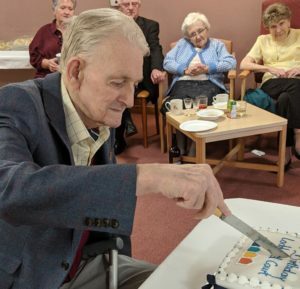 The honours of cutting the anniversary cake were given to Mr Bill Hood who has lived at Lochhead Court for 20 years and first moved to the development with his wife Agnes who has sadly passed away.